What a beautiful few days we’ve had and it has given me the opportunity to put my next list together. So a big welcome to my 2019 plant list. 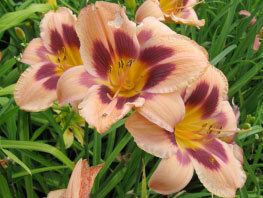 I have a very significant birthday soon, 70 years old but my enthusiasm for daylilies still continues. Yet again I have had so much fun putting the catalogue together although I must say sorry that as ever there still isn’t all that much new for my very loyal customers. I have yet again revamped the catalogue a little, please check out the special offers which are now on the back page. 2018 was a strange year for us, we lost our lovely Chyna dog at a very good age and decided at that time that we wouldn’t be getting another. However, after only a few weeks yours truly found that I couldn’t cope without my lump of fur on the carpet and we now have Lily, a monster of a Labrador, keeping us both young and generally exhausted. 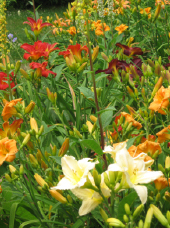 I can’t talk about 2018 without talking about that wonderful Summer, almost too hot and dry for the daylilies but still remarkable, long may these magical days continue. 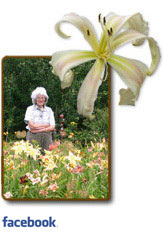 For those of you who are looking at the list/website for the first time you will soon discover that I am truly a daylily fanatic and hold the National Collection of Spider and Unusual Form daylilies, (now numbering something over 700), out of a complete collection of just over 2000+ For those loyal customers who have read all this before sincere apologies for the repetition! 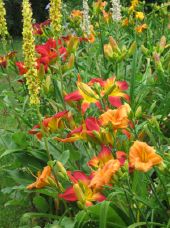 Some of the plants that we grow here are very new to this country and we continue to trial them for weather hardiness and overall performance so that when they finally clump up sufficiently, we can supply you with good garden worthy plants. Sadly, this can take a few years and we are very grateful to all our loyal customers who are prepared to wait for them. 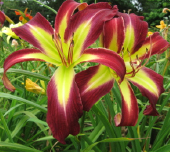 Now to the catalogue, plants will be sent out/sold on a first come, first served basis from mid March to June subject to weather conditions and again during September and October. 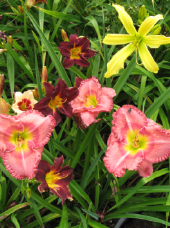 They travel through the post bare rooted and most of the daylilies I am offering are growing on in 2 litre pots at present and are, (with some exceptions), almost always at least 2 fans so hopefully they will grow on well for you and be just what the doctor ordered. 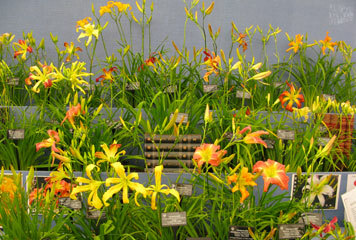 As ever you will see that the prices of the plants vary a great deal. 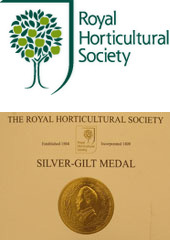 In some cases the cultivars offered are still rarely available in the UK and the prices reflect this. 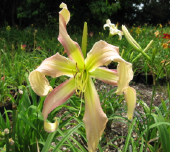 As far as the limited list is concerned if you do not order early it would probably be advisable to contact me first by telephone or by e-mail to check that plants are still available. In nearly all cases last year we were able to provide all requests and I don’t send substitutes unless you provide me with a list or I have discussed this with you first. You have the option of paying by cheque, direct payment into the bank or Paypal. Please also make sure you take advantage of the discounts as detailed on the order form. 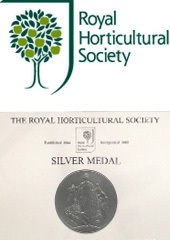 As far as my mail order efforts go it continues to be very reassuring and encouraging to receive all your lovely e-mails, cards and letters to tell me how happy you are with your plants and how well they are growing. It really is very kind of you to bother As usual the catalogue is available as a PDF giving you the opportunity of looking at the catalogue pictures in full resolution thus enhancing their beauty! We are still sorting out the website and hopefully we will be able to get a few more pictures on there soon but as usual we spent far too much time looking at the display and not taking pictures last year. 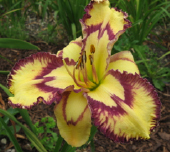 Please also click on the direct link to the Pollies Daylilies Facebook page if you want to see what exciting blooms appeared last year. 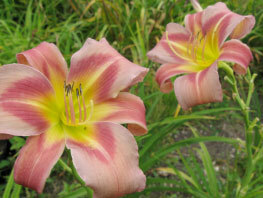 Our hybridising efforts are continuing and as usual there was so much to see, assess and compost too!. 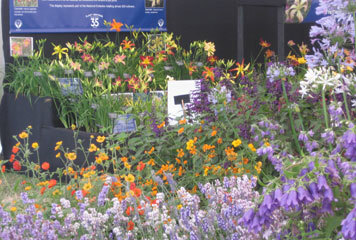 We again had some lovely new seedlings blooming last year and can’t wait to see what this year brings. So, hopefully lots to look forward to again. Saturday June 15th to Sunday August 11th 2019. Leaving you with a few pictures of some of our latest acquisitions and some views of the displays. Hope you like them.